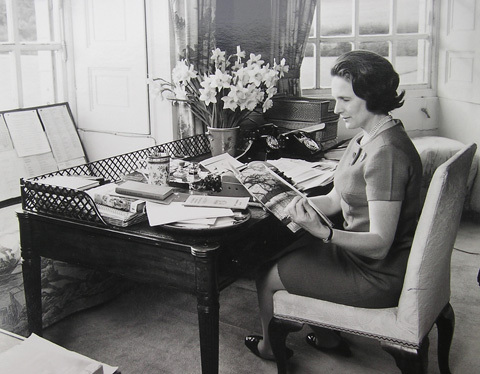 The Marchioness of Anglesey was National Chairman of the NFWI from 1966 to1969. Daughter of Charles Morgan, the novelist, Shirley Morgan grew up in Wales. When she married Sir George Paget, 7th Marquess of Anglesey, in 1948 she inherited the interest shown by her husband's family in the first WI in Britain at Llanfair PG. A cousin of the Marquess, Col. Hon Robert Stapleton Cotton, played an important part in getting the WI started; he allowed the new WI to meet in the Toll Gate House free of rent for over 25 years, and the Marchioness became a patron. Dame Shirley Paget joined Llanedwen WI and subsequently became a member of the Anglesey Federation executive committee. She was elected to the NFWI executive committee at the young age of 29 when she had three small children. Dame Shirley Paget sat on the Royal Commission on the Environment and a working party on sewage disposal, which WI members helped by providing evidence of inadequate services in the rural areas which were included in the report. She was Chairman of the Welsh Arts Council and the Civic Trust for Wales. In 1967 Dame Shirley Paget toured some of the projects in Colombia and the Caribbean that received money from the WI’s fundraising for Freedom from Hunger Campaign. She was a Trustee of NFWI until incorporation in 1991.